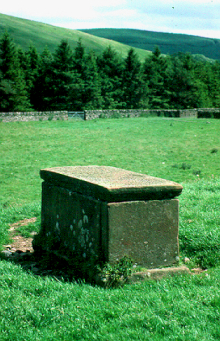 The Scottish Covenanter Memorials Association was established in 1966 with a view to preserving the many memorials which date from the “Killing Times” of 1638-88. The membership of the association totals approximately 400, and all members are volunteers. Many members visit and care for the memorials, carrying out simple cleaning and tidying operations. More difficult, technical work is carried out by professional sculptors, who are paid from our funds. Charitable status was granted to us in 1993. A colour newsletter, extending to twelve pages, is issued to members three times per year. Members pay a minimum nominal subscription, but many members donate more than the minimum amount, which ensures that we have sufficient funds to continue with our work. We hope you enjoy browsing our new website. 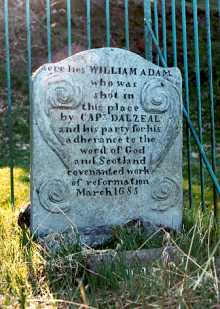 It is still being extended, and will eventually include all monuments and gravestones associated with the Scottish Covenanters. Come back again! If you wish to join, fill in an Enrolment Form. We look forward to hearing from you! The Search Box to the left will help you navigate to places and people of interest in this site. 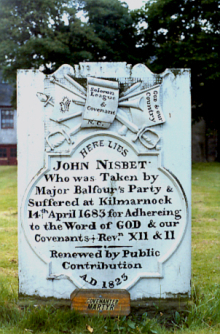 We issue an irregular email newsletter between our members' printed newsletters to update information and inform of conventicles taking place at Covenanter graves, etc. This is available to members and non-members alike. If you wish to keep in touch, then please sign up using the box to the right. You can unsubscribe at any time.